Row cover is installed directly over first set of hoops and often anchored into bed along one edge. A second set of hoops is installed over the cover at every 2nd or 3rd hoop. 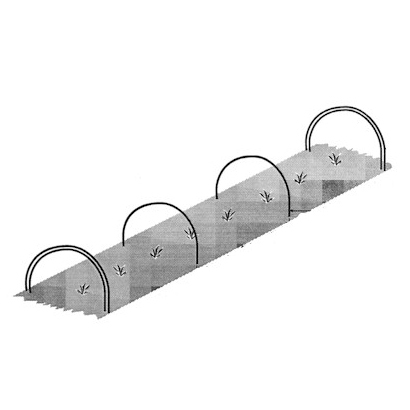 Thus, the cover can be raised up through the dual hoops for ventilation and plant management. GENERAL: Unless otherwise specified, all hoops are made from pregalvanized wire for years of repeated use. They are formed into 180 degree arcs. The opening between wire ends approximates the bed width in the field. The hoops are banded on both ends with 100 or 200 pieces per bundle then stacked on a pallet averaging 1,000 lbs. 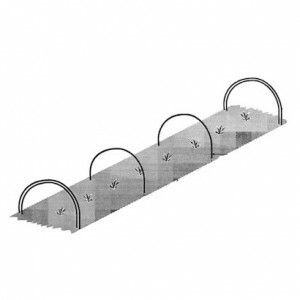 WHEN ORDERING: Specify opening between wire ends or provide bed width and height. Specify wire gauge desired if other tha standard 9 gauge. when wire ends are buried 6″ into soil. Height can be increased by installing ends closer together than the indicated hoop width.